This year's presidential race has a lot of people talking about identity - what it means to be a woman, a Republican, an immigrant, a blue-collar worker from the Midwest. But what does it mean to be an American? We're going to explore that question this week as part of A Nation Engaged. It's our project with some member stations about the issues at stake in this election. SHAPIRO: The answer this afternoon comes from a Haitian-American named Jan Mapou. He's a poet and storyteller who owns a bookstore in Miami, and that's where NPR's Greg Allen found him. GREG ALLEN, BYLINE: Miami's Little Haiti neighborhood is clustered along 2nd Avenue - a lively business district of pastel-colored shops, including a bookstore owned by Jan Mapou. He says it's the only Haitian bookstore in the U.S.
JAN MAPOU, BYLINE: Anything about the history of Haiti - you'll find it here - about the religion, about poetry, novels, you know? I got it. ALLEN: Mapou is 74 now. 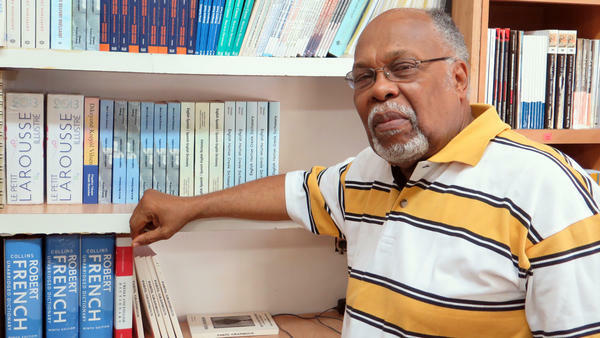 He's lived in the U.S. for nearly 50 years, most of that time in Miami where he hosts a weekly radio program in Creole. ALLEN: The program airs on member station WLRN. It's presented by the school district and called "Radio Lekol" - school radio. MAPOU: Everybody relaxing by learning Creole, you know, Haitian and non-Haitian as well. ALLEN: Mapou doesn't talk about politics much on his show, but he votes in every election and is a community leader. He felt it was important to become a U.S. citizen as soon as he could after moving here. I asked him why. MAPOU: You feel that you are in your country, you know? And part of it, you have to contribute. And you are working very hard. You are paying taxes, and you need to have a voice. This is yours. This is your property. And also you know, the American dream - in order to dream it properly, you have to be an American (laughter). ALLEN: Well - and that's really the main question that I wanted to ask - is, what does it mean to you to be an American? MAPOU: It means that you are part of the system, and you are there to enjoy your rights, civil rights, you know, all kinds of rights, you know, anybody has in this country and also to participate in the development of the country. It is an honor to be an American because you got your rights. ALLEN: Mapou says America stands for democracy and a system where citizens follow the rules and respect others. America is an important role model for other countries. With globalization, he says, the U.S. is closely tied with other nations, and the president has to be someone who, in his words, knows the world. MAPOU: So you have to understand others. You have to understand where we have problems and how to solve them, not creating more problems. We have to find a way to live together with other people because America is a land of immigrants coming from all over the world. So you have to understand each culture, each religion, each people in particular and try to cement them together and live together, you know? ALLEN: That's Haitian-American bookstore owner and radio host Jan Mapou. Greg Allen, NPR News, Miami. SHAPIRO: Mapou is from Maki, Haiti which was devastated by last week's hurricane. Some of his nieces and nephews lost their homes, now he's helping groups in Miami that are raising funds for hurricane victims. Transcript provided by NPR, Copyright NPR.